As promised here is a write-up on drift diving speciality. This will be available on the Maldives Trip and it highly recommended as Maldives is one of the best places to enjoy drift diving. If until now your experience has been that current are something you fight to swim against; drift diving will give you a whole new perspective. Drift diving grew out of the philosophy, “if you can’t beat them,join them” and is the prevailing practice in many areas with nearly continuous strong currents. Drift diving can give you a real adrenaline pump. At some drift dive sites,the current rips you along far faster than you could swim, or even cruise with a DPV (Dive Propulsion Vehicle), sailing you along effortlessly. Some divers compare drift diving in clear water to hand gliding or horizontal sky diving but no airplane needed and you don’t have to worry about your chute opening. Drift diving usually requires little effort. During the dive, you just go along for the ride, buzzing through the scenery with the current “swimming ” for you. Drift diving opens up dive sites that are nearly impossible to visit any other way. In particular, rivers and some reefs are constantly in strong current that precludes non drift dive techniques. Since you are floating along in the current, you cover more area and see more on a drift dive. Many types of drift diving relieve you of having to return to or look for a specific exit point. The boat travels with you. All you have to do right now is contact us and book for your drift diving speciality for the Maldives Dive Trip happening this month. Don’t miss out on a great oppurtunity!! That’s right, it is here. The hottest new ” must be seen” event in India. Divestock 2009!! Made by and made for scuba divers and everyone else who loves a good party. Its inaugration will be held in Port Blair and in Havelock in the Andaman Islands. You know you want to be there. you know you have to be there. THIS IS THE PARTY you have been waiting for! 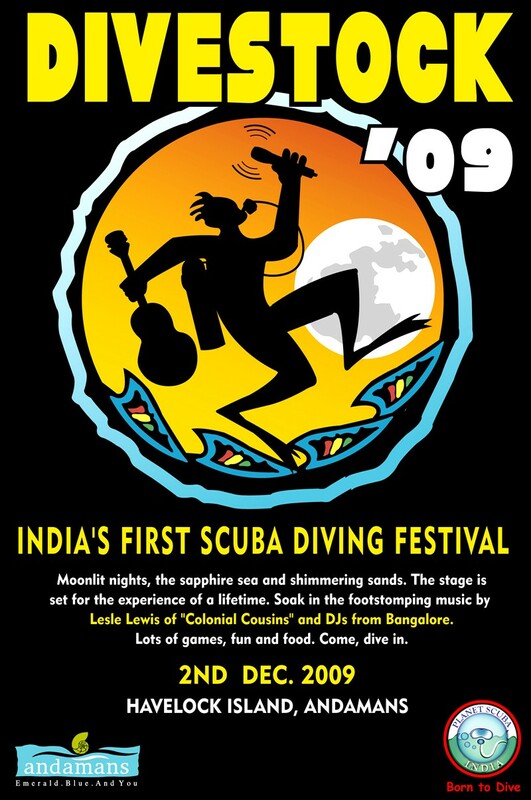 Bangalore Dive Club together with Planet Scuba India has once again managed to take dive trips to a whole new level. The Nethrani dive trip saw a unprecendented 40 divers from India descending on Murdeshwar’s shores. It was a huge number of people and it was a show of strength from the divers. Nethrani was closed to diving after an incident involving the arrest of some divers. This happened post 26/11 when security was a knee jerk reaction to the terror incident in Mumbai. After numerous efforts by PSI and the local diving community, Nethrani finally got approved for scuba diving. Divers were all in high spirits waiting to begin their adventure in these “forbidden” waters as such. There was a high level of camaraderie and anticipation in the air. Even though visibility on the first day was poor due to heavy rains the night before the marine life underwater more than made up for it. Huge lobsters, cuttlefish, moray eels and many more varieties of fish kept the divers completely entertained. It truly was a fantastic dive experience. There were press involved in this dive trip as well. They got a taste of what scuba diving is all about. The one thing that struck both press and divers is the extensive damage that has been done to the marine environment due to excessive fishing. There was mutual concensus that something had to be done to curb discriminatory practices of fishing and some sort of basic education needs to be imparted to the fishermen on what to fish and how to do it the right way without destroying the environment in which they too are dependent on. All in all, it was a fantastic 3 days of diving and everyone had a good time. Here’s hoping that Nethrani becomes the diving paradise that it is in good time.